Buying a new horse and bringing it home is very exciting, even for experienced horse owners. It’s an exciting time for the horse too. They will have been uprooted from familiar surroundings and separated from pasture mates. Water may taste different. The feed may change slightly and things like shelters, stalls, and fences will be in different places. There are new people, companions, and schedules to learn about. All the changes may make your horse a bit nervous. Some will become very unsettled and take a bit of time to adjust, while others will feel comfortable quickly. Your horse should be healthy before you bring it home. You don’t want to be responsible for an outbreak of strangles or other diseases. 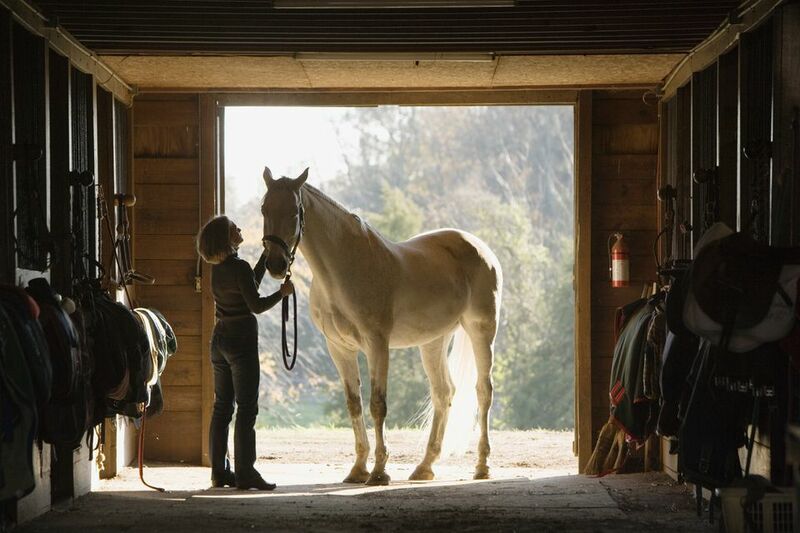 Before your horse arrives, you’ll want to be sure that your horse’s new home is safe and comfortable. Inspect fences, stall walls, gates, doors, and the ground for any hazards your new horse may hurt itself on. Be sure all fences are sturdy and in good repair. A nervous horse can jump over a stall door, try to barge through a fence or climb a gate. Hopefully, this isn’t the case with your new horse, but it’s best to be aware and make things as safe as possible. At first, your horse’s behavior can seem quite different compared to what it was like in its former home. Most horses settle down after a time. Being moved to a new home is very stressful for a horse. Some horses take it in stride, others are more tentative. If there are other horses, you’ll want to have a spot where your horse can see them from a distance, but not mingle right away. Different people have different approaches to introducing a new horse to a herd. We’ve discussed that in Introducing a new horse to a herd, so you might want to check that out. It will take time for your horse to get used to its new home, and it may take a while before your horse finds its place in the herd pecking order. Expect some nervous moments before everyone settles down. You’ll also want a safe where you can get to know your new horse a bit better. So you need a place to tie your horse safely. Grooming is a great way to get to know your new horse. Again, tie your horse safely. During grooming, you may find your horse likes or dislikes certain brushes, or being brushed on certain areas of its body. Most horses like their chests scratched, and this can be a way to make friends. Be careful about brushing or scratching around flanks and bellies and these can sometimes be sensitive spots. Go slowly and use these sessions to learn about your horse, and learn about things you’ll need to work on. Try to be with your new horse as much as you can, so it can get used to how you do things. If you’re feeling confident, and your horse seems to be feeling comfortable, you’ll probably want to ride your new horse right away. Keep in mind that your horse will be in a new environment, and that can affect its behavior. Be firm, but don’t be overly demanding the first few times out. This is a getting-to-know-you period for you both, so you’ll want to take things one step at a time. The horse will want to look around, and perhaps even smell things and this is natural. At first, you’ll want to keep your new horses feed consistently with what it has been getting previously. Make feed changes slowly. If your horse hasn’t been kept on pasture, be sure you introduce it to lush grass slowly. A quick transition from hay to pasture grass can cause problems. If the horse is used to a certain kind of hay, you may want to buy a few bales so you can change over slowly. Be sure to have salt available. You may even want to show the horse where to find water, shelter, and hay, especially if it is living alone. A horse should have some companionship, however. Horses are herd animals and are more comfortable when with other horses or a companion animal. If your horse is losing or gaining weight, is getting beat up by other herd mates or is showing other signs of stress it’s time to make some adjustments. It can take months before your horse is fully familiarized with its new home. The first year is a learning experience for you both as you spend all seasons, weathers and different situations together. Real bonding between a horse and owner takes time as does your horse’s adjustment to its new home.